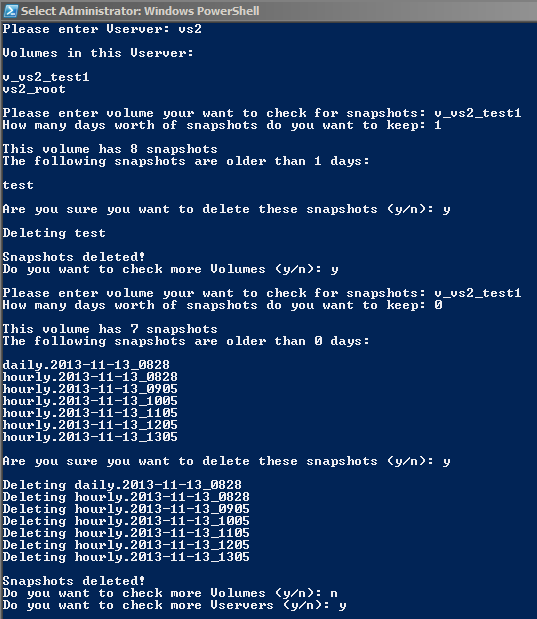 Here we present a PowerShell script which allows you to delete snapshots for volumes on your NetApp Clustered ONTAP clusters that are aged over a certain number of days. This is the interactive version and the next blog post presents a non-interactive version that could be run as a scheduled task/add-on script to an existing process. ## then cycle and repeat! 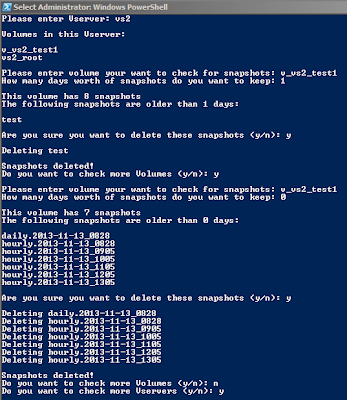 echo "CDOT SnapShot Deletor (Interactive)" ""
$controller = Read-host "Please enter IP of cluster"
$user = Read-host "Please enter username"
echo "" "connecting ..." ""
echo "Vservers in this Cluster" ""
$vserver = Read-host "Please enter Vserver"
echo "" "Volumes in this Vserver:" ""
$volume = Read-host "Please enter volume your want to check for snapshots"
$daysWorth = Read-host "How many days worth of snapshots do you want to keep"
echo "" "This volume has $snapCount snapshots"
echo "The following snapshots are older than $daysWorth days:" ""
$confirm_delete = Read-host "Are you sure you want to delete these snapshots (y/n)"
$confirm_do_loop1 = Read-host "Do you want to check more Volumes (y/n)"
$confirm_do_loop2 = Read-host "Do you want to check more Vservers (y/n)"
$confirm_do_loop3 = Read-host "Do you want to check more Clusters (y/n)"